One of the best iPhone games has just got a major update. 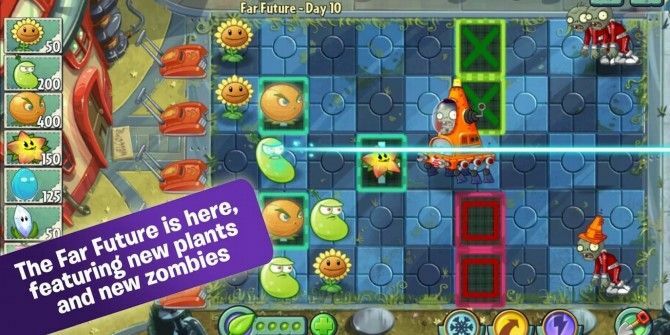 Plants vs. Zombies 2, the popular base defence game, has got a whole new world full of many levels and new plants to go with it, along with unlocking the Zen Garden. The game and update remain completely free to download on both iOS and Android, but that doesn’t affect gameplay Plants vs. Zombies 2: Does Going Free-To-Play Mean The Death Of The Series? Plants vs. Zombies 2: Does Going Free-To-Play Mean The Death Of The Series? Since EA has taken the reigns at PopCap, Plants vs. Zombies 2 has been released for free. By free I am referring to the game being free to download initially, with plenty of in-app purchases... Read More . Far Future World brings you 24 new challenging levels, eight new zombie-hating plants, 10 new brain-hungry zombies, and much more! New plants include the Citron to deal damage to mech-zombies, Laser Bean to fight off shield zombies, Infi-nut to regenerate health, Blover to blow away jetpack zombies, and several others. Meanwhile, back in the Zen Garden, you can find the Zen Garden Bee to speed up time. The new Zen Garden is a virtual garden where you take care of your plants and help them grow into powerful warriors that you take into battle. One of the great parts about Plants vs. Zombies 2 is that it doesn’t require a connection to play 20 Best Offline Games on Android That Don't Need Internet 20 Best Offline Games on Android That Don't Need Internet These best offline games for Android are from all genres, including strategy, puzzle, racing, and more. No internet required. Read More , so you can enjoy it offline. Things like this are what made it one of the best Android games of 2013 Mobile Gaming Comes Of Age: Best Android Games In 2013 Mobile Gaming Comes Of Age: Best Android Games In 2013 Shooters, runners, arcade, racing, puzzles -- we show you the best games released in 2013 for just about every genre. Beware, addictive picks inside. Read More . Plants vs. Zombies 2 is a free game that you can download from the iTunes App Store or the Google Play Store. If you already have it, head to the store or start the game to receive the update from a prompt.